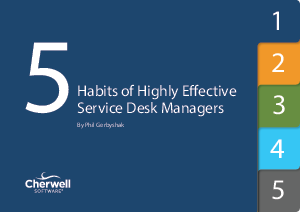 Discover 5 habits of highly effective IT service desk managers in this complimentary guide. Written by Phil Gerbyshak for both new and experienced service desk managers, this eBook offers best practices which will benefit not just IT, but the organization as a whole. For the experienced service desk manager, you’ll find years of practice and current trends in a nice, neat package, offering a practical take on what’s received, during the years, the best results.